Rugby is played everywhere in the world. Absolutely everywhere. Even at the Bottom of the World. 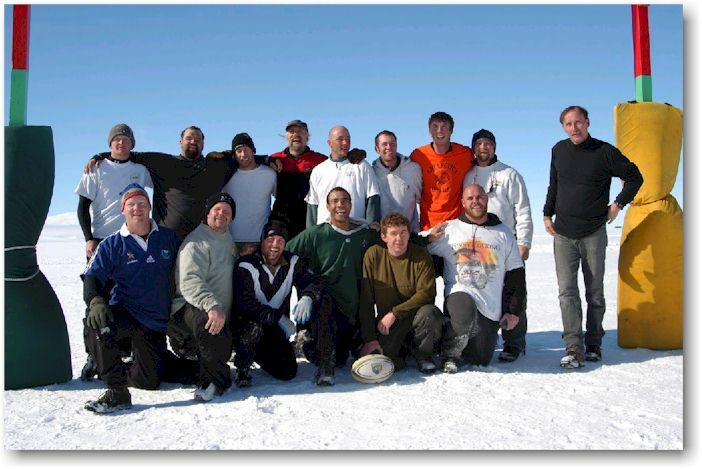 I stumbled across the Rugby Reader's Review in a search for links about Antarctic Rugby. 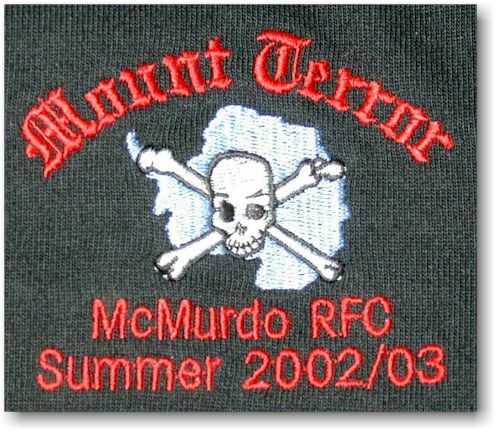 I have been going down to McMurdo Station since 1999 and have been participating in the annual match vs. Scott Base every season that I have been "in town". I thought you might like some updated pictures, as we have come a long way in the past few years. Our pitch now sports posts, and is groomed with a Pisten Bully ski field groomer. The pitch is also laid out by the surveyors on the ice (a bit smaller dimension than elsewhere in the world, but the snow and ice and weather make up the difference!) so that the dimensions are exact. Last year we were sponsored by several NZ companies who purchased 31 jerseys for the two teams and the ref. Unfortunately the jersey colors were Navy and Black, so you can't tell them apart. 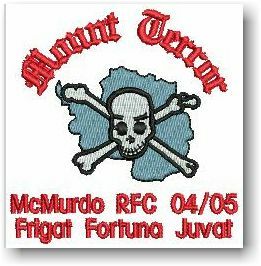 The image above is a close-up of last year's embroidery (this year's is about the same, except that the second line reads "Frigat Fortuna Juvat" or "Fortune Favors the Cold!"). This year we had to play in motley as the kiwis had all the jerseys. We intend to rectify that next year! Sorry I've been so slack about keeping in touch. The summer has been rather hectic. As it is, I have another week in the office before I am off to NZ for training then back down to the Ice. We have already started planning for our upcoming rugby "season", and I recruited two other "coaches" this year. It looks like we will be wearing motley again this year, as we were not able to get the funds to do a team jersey order. That is a priority for next year, and fund raising events on the Ice are being planned. We have also established ourselves as a team with rugbyimports.com, so if you have any sway with your readers, perhaps you could encourage them to list us in their orders so that we can progress towards our team jerseys. 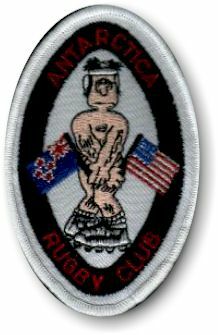 (Our team code on the Rugby Imports site is "MIL801.") And, should anyone want to donate directly, please have them email me. We would also love to get a sponsor, and are planning on approaching a bar in Christchurch, NZ called Bailey's Bar (located on the NW corner of Cathedral Square) where most of the Antarctic refugees hang out on their way to and from McMurdo Station and the South Pole. If you know anyone who would like to sponsor us, please have them contact us at the above email address, and we can work out how to get their logo on our jerseys. Hoping all is well with you. I'll keep the updates coming as there is news. Pictures to be had, if you like. New Zealand has triumphed in the first rugby "test" of the year, beating a traditional foe by a single try. 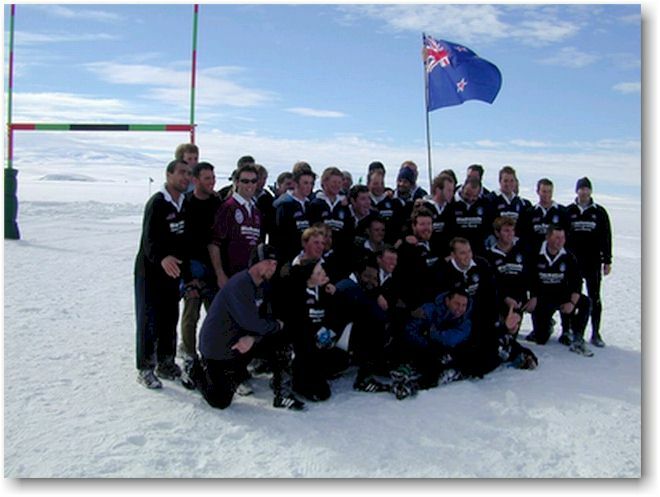 The 5-0 win was enough to keep alive the Scott Base rugby team's unbeaten record in the world's southernmost rugby tournament against the Mount Terror Rugby Club, made up of Americans from neighbouring McMurdo Station. 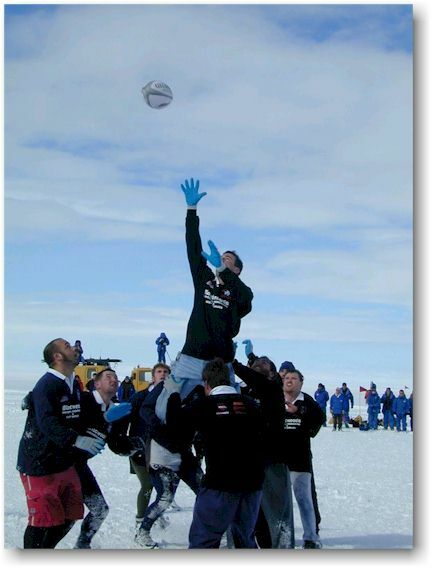 Scott Base manager Emma Reid said conditions were bitter at the annual test on Sunday, with an 80kmh wind blowing across the rugby field, located on a 300m-thick ice shelf. "It's a harsh continent. It was extremely cold, but everyone was rugged up," she said. "It was a fantastic game." The score was closer than in recent matches, such as the 27-0 rout two years ago, but this year the American team has had the benefit of months of training and coaching by captain Keith DePew. DePew, with rugged but youthful good looks, played rugby at college and in state competitions.